Smoke and Mirrors: Colorado, Massacres, Superheroes, and Spooks, Oh My! Colorado, Massacres, Superheroes, and Spooks, Oh My! What is it about the apparently "random", indiscriminate killing of a large number of human beings in a rather upscale part of our nation? That is, Denver, Colorado. I believe a concept known as “culture of honor” is one of the key factors that compelled a core group of school shootings. While, that may partially factor into what's behind the - relatively speaking - frequently occurring bloodbaths in Colorado, I believe, based on the research of Bill Zabel, Evan Long, and Rolf Zaeschmar that something far more sinister may underlie these occurrences, perhaps, a "culture of heraldry", in all its various states of definition. Let me explain using the Columbine massacre as a template. According to Zabel, Denver Colorado, is home to a vast number of either, employees of defense contractors - Lockheed Martin, Boeing, Comcast, which has a division in the Littleton area that houses NSA offices, and supposedly, does a lot of classification stuff - and former and active military intelligence, CIA, and FBI agents, including Dylan Klebold's father, Thomas Klebold, who Zabel saw in a BBC clip, in full uniform after the incident, on the scene. The BBC caught three vehicles, headed by a state trooper car, followed by a big panel black van followed by a green minivan. The camera pans the passenger side of the green mini-van there he saw Thomas Klebold, who he spoke to during the hearing. Eric Harris' father, Wayne, was a decorated Air Force pilot and intelligence operative who moved from Air Force base to Air Force base. His last stop before he retired and the family moved to Littleton was Plattsburgh Air Force Base. At Plattsburgh, Harris complained to friends that he was being forcefully drugged on the base and one researcher/scientist at the base told an alternative news organization that he was one of the many "guinea pigs" of an MKULTRA-type project being run at the base. Harris had been born in Kansas, where his father worked at a Boeing plant involved in black operations/projects. When they moved to Littleton, his "retired" father took up a job with FlightSafety, Inc. (Which would later train one of the alleged 9/11 hijackers), a military contractor. There, he taught people how to fly large refueling jets -- a type of aircraft used mostly, if not only, by people in the military. Aurora is home to a large Defense Department satellite intelligence operation at Buckley Air Force Base. In the military, you have a top-down tiered system. The first team is the front team. The second team is cleanup. The third team is the most secretive team, the administrative team. They handle the media, the victims, local law enforcement. In other words, three teams working in layers. Harris and Klebold, were the main actors, possibly set up for two years to do this. Then you have the real shooters, the trenchcoat mafia, and then the black-op military cleanup team. The public, semi-public, and the private team. Even mainstream media "activist" Michael Moore admits to the overwhelming presence of the military industrial complex in the Denver area. If Columbine was a cover-up, and all the evidence points to that being the case, the complicity of some of the parents, students, and the Columbine/Littleton population would be required. For most of us, that idea is absurd; however, as Zabel pointed out, the Columbine community is primarily an evangelical “Christian” group; however, once inside many of the homes, he found Satanic literature, and symbols. In other words, he found a very present occult "side" to the town and school. It was also reported that several of the teachers at Columbine may have been complicit. Judy Greco, the special-ed teacher, according to Zabel, is an admitted Wiccan who stated that she used a military-grade device to put her class under a "trance", and she helped Klebold and Harris with the basement tapes that are still sealed to this day. The discrepancies between the "official" story, and actual eyewitness testimony, government documents, especially the 11,000 page report (11K), abound, as is starting to occur in the Batman movie massacre. 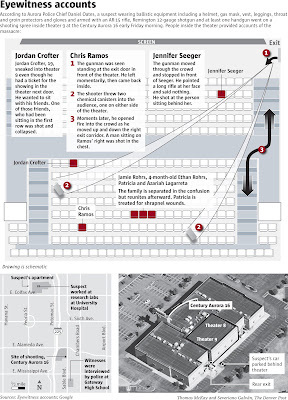 Eyewitness accounts, and government documents in the Columbine case report several additional shooters (The Denver Rocky Mountain News reported that dozens of witnesses reported that there were "five-to-eight" shooters); additional dead; additional injured; time line discrepancies; evidence not consistent with official reports; and the destruction of evidence - including all of the output from the fire alarm and water sprinkler system, all of the videotape evidence, all of the receipts from the school store and cafeteria because they have a time-roll on them, etc. At approximately, 4:30 PM, a 4-star general pops out of the sewer grate that connected to a tunnel that led to the school's underground, right there in the news footage that was seen on local news, but edited for CNN. A mock lock-down shooting event drill one week prior to the event. "Men in black"-style feds were seen in the halls of the school at 9 AM -- two hours before the start of the shooting. 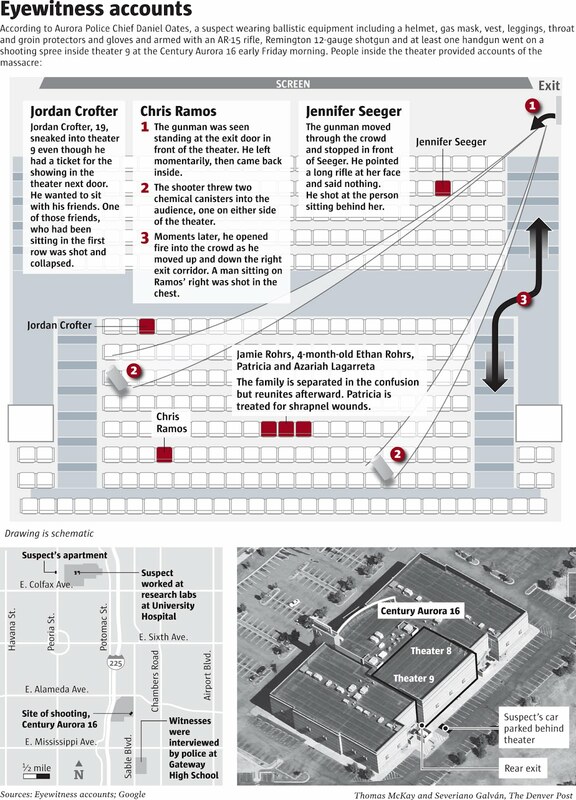 The shooting that allegedly ended at noon, when the two boys were said to have committed suicide in the library (Which no one saw), the Denver Post reported that shots rang out inside the school at 3:45 PM. NATO vans were observed at the school by a number of witnesses, as were high-ranking military officials, including that four-star general. The final report stated that Harris and Klebold brought 95 bombs into the school, including large, heavy 20-pound propane tanks, which were, according to initial reports, "too sophisticated" for them to have built. It would appear to be absolutely impossible for two boys to transport 95 bombs into the school and plant them without being caught. Why? Possibly, to cover a wide time-frame, because cops always leave a narrow time-frame open within a couple of minute to a half hour because it’s all but impossible to pinpoint an exact time. What about the footage in Michael Moore’s Columbine? Those tapes went to the FBI lab at Quantico before the public ever saw them. Rich Price of the FBI, on the news, said, “We enhanced the footage from the cafeteria". According to Zabel, trained in film and video post production, if you blow that footage up on an avid workstation, you can see little pixels around Harris and Klebold that when they move, in slow motion, change color, which they should not if they were in that frame originally as they were walking around that cafeteria. Moreover, after Zabel finished reading law enforcement reports, he discovered that they were all typed up. Why is that a problem? He found out that in order to be authentic, or used in court, reports must be handwritten by witness or victim, signed and dated. Out of 2,000 witnesses, only a dozen handwritten testimony remained. In the witness typed statements, in statement after statement, it was stated the shooting started at 11:21 A.M as if they all knew the exact time. Witnesses almost never know the exact time, down to the minute. In addition, all of the autopsy reports are sealed. It's also interesting to not that, regarding the Batman movie shooting, the Denver Post reports that Colorado university staged an identical exercise the same day in which students were trained how to react to a gunman firing at people in a movie theater. Is the Batman movie massacre distracting us from anything important? The United Nations prepares its final push to ratify a controversial gun treaty. Support for gun control is always galvanized when a "random" mass shooting occurs somewhere. Judge Seals Batman Shooting Case Well, that was fast. Was the "Batman movie" shooter mind controlled? Scopolamine, also known as "The Devil's Breath." It's a substance so intense that it renders a person incapable of exercising free will. The first few days in the country were a harrowing montage of freaked-out dealers and unimaginable horror stories about Scopolamine. After meeting only a few people with firsthand experience, the story took a far darker turn than we ever could have imagined. Image from Denver Airport mural. Note gas mask, multiple weapons and rainbow colored spectrum of light shining overhead, which is exactly what theaters use to project images on a screen. I think you may be on to something, especially regarding the military connection, and the strange atmosphere surrounding that area of Denver. 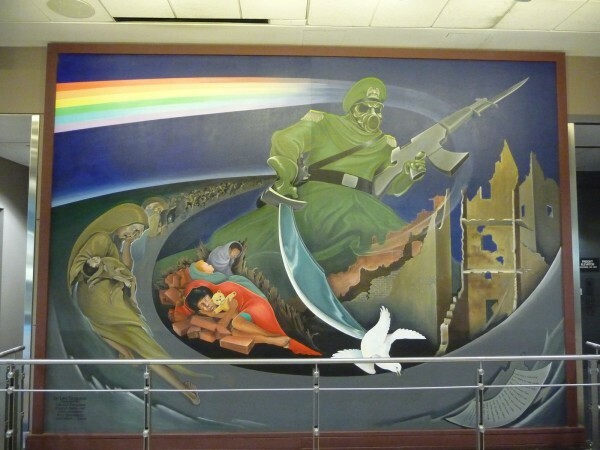 The Denver airport is freaky as hell. James Holmes, the man believed responsible for killing 12 people Friday during one of the largest mass shooting in U.S. history, is the grandson of a decorated military veteran who was a respected educator at prestigious York School in Monterey. Lt. Col. Robert M. Holmes, who served in the Okinawa campaign during World War II, retired in 1963 as the last commander of the Nike missile group in San Francisco Bay. He was one of the first Turkish language students at the Army Language School, now the Defense Language Institute, graduating in 1948, a school spokesman confirmed Friday. After his military retirement, Holmes taught math and science at York School for 17 years. He died in 1990. His wife, Mary Jane Crawford Holmes, attended Stanford University and worked at the Monterey City Library, Fort Ord Library and Pacific Grove High School before finishing her career as librarian and college counselor at York School. She died in 2010. A 1945 graduate of Pacific Grove High School, she was also a member of numerous historical societies, including the Order of the Crown of Charlemagne, Descendants of the Ancient and Honorable Artillery Company of Boston and the Monterey Bay Colony of Mayflower Descendants, of which she served as governor. Their personal histories, taken from their obituaries in The Monterey County Herald, are difficult to reconcile with the most indelible image of their 24-year-old grandson.